You might be asking the question, what the heck is Sling Media? I was at first too. Then I saw an advertisement for the product and it created more confusion. Its design resembles a gold brick! However, after poking around a bit more on the Internet I have found Sling Media's Slingbox to an invention that could change the way we view and manage our television experience. The Sling Media Slingbox device is similar to TiVo in that it allows you to record television programming by scheduling to record up to 3 days in advance. The key distinction between Slingbox and TiVo is that Slingbox enables a user to access their home television service from anywhere in the world. Also the Slingbox is not meant to replace TiVo but can be hooked up to work with TiVo. How does Sling Media work? "The Slingbox redirects, or "placeshifts", a single live TV stream from a cable box, satellite receiver, or DVR to the viewer's PC located anywhere in the home. If the Slingbox is coupled with a broadband Internet connection, the viewer's live TV stream can be "placeshifted" via the Internet to a PC located anywhere in the world." So next time you are in a hotel room with an Internet connection and you want to watch your TV programs that you recorded at home, now you can! "Slingbox™: Watch and control your TV, anywhere." This is an amazing invention and it is no wonder that Time Magazine has named it one of the top inventions of 2005 among a long list of other awards. I think it is only a matter of time for this invention to catch on with the masses. I also feel this invention will drive more people to set-up media center television stations that are really just glorified computers to take advantage of the benefits of the Slingbox. Additionally, Sling Media is also soon to be offering the software that controls the Slingbox called SlingPlayer with the ability to send media content to PDA's and other devices similar to the recent TiVo move to allow users to add content to an iPod. For more information on Sling Media check out these posts on Informitv, SlingBox.org, QT Monster's Place and TV Squad. Let's just sit back and watch as the Slingbox becomes more well known and hits it tipping point. It should be exciting to watch. 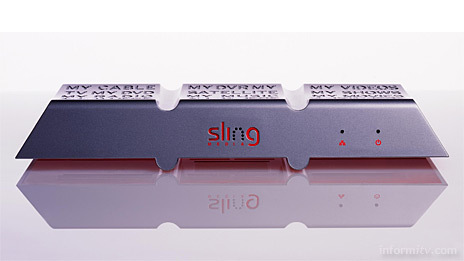 With the holidays approaching maybe you should add the Slingbox to your holiday wish list. If you are interested in bypassing the wait for the holidays you can order Sling Media now via Amazon.